Click the "Add to Cart" button next to the item you're interested in. You will be taken to the secure PayPal Web site. Please email menu@foodnotbombs.net if the order needs to be rushed. Mail from northern New Mexico is not as fast as most areas of the United States. We can email you a tracking number when orders are shipped. Thank you so much for your interest in Food Not Bombs. You can also make an additional donation at our Dollar for Peace page. A regular monthly contribution is very helpful. 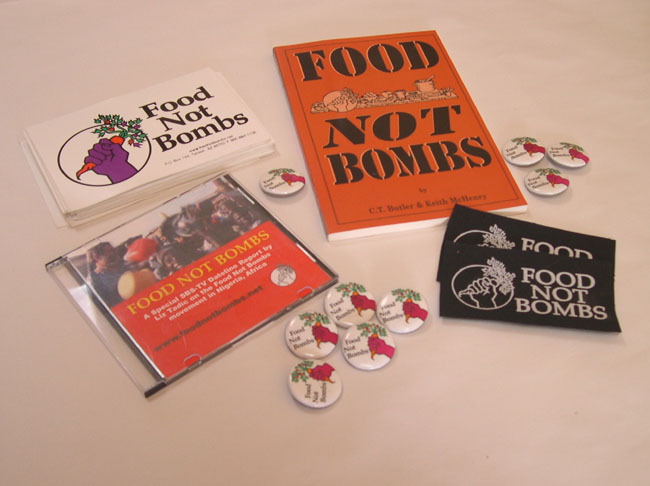 Thanks so much for your support of Food Not Bombs.